A Cardboard Problem: This is how you know you have a problem. Sadly (or as I see it, happily) I am like a big kid in many ways. When I go to a store I usually have to leave with something, call it spoiled or call it bad with money it's just how I'm programmed. Last night I stopped at Shoprite, which sounds innocent enough but there was the temptation right at the exit- the trading card vending machine. Now if only they had these in schools and workplaces people would have way more fun than they would if they bought Skittles. I saw this pack on the top row with a cost of $0.75 and thought it looked mildly suspicious. 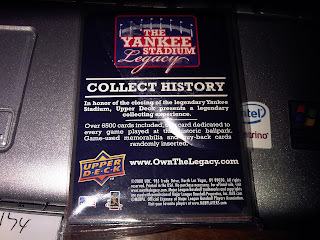 My spidey senses were tingling when I saw the Yankee Stadium Legacy ad card in front, yet the side profile of the pack looked like Upper Deck base cards, with some Topps mixed in. 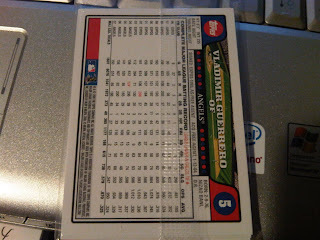 I knew there were not going to be any YSL cards in there but was curious how UD and Topps ended up together. So out came the wallet, out came the dollar, and I said, "Here goes another waste of money," and in the machine it went. Shhh, stop talking. You had me at "trading card vending machine." The only bad thing about card vending machines is when the cards get stuck. That... is much worse than when skittles get stuck. You call it a problem - I call it a gift. wow, what a find, a 2008 NTCD pack. When you mentioned Topps and UD could be in the same pack, all I could think of was that company that buys cases of topps and UD and old fleer, score, pacific, etc. 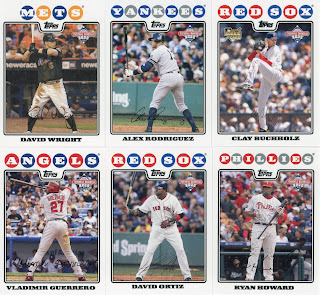 products, removes the superstar, star rookie and relics/auto cards, and then repacks the cards into lots that you can buy at wal-mart, from mail order ads in magazines and sunday paper magazines, and other retail outlets. I was thinking they probably are into vending card machines now, making packs of assorted cards that you can buy from vending machines. 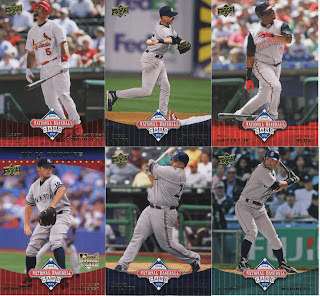 that company may have packs in that machine, but the pack you pulled was the real deal from the card manufacturers/MLB/MLBPA for NTCD, not something repacked by that company for the vending machine. Was there a National Trading Card Day this year? If so I missed it. Very nice find! And, Joe, that was funny!! I almost got into that business in the late 90's. Just couldn't pull the trigger on the deal. I was always afraid I'd get stuck with product that no one would buy or I wouldn't be able to find enough stores to sell them in. There are a couple of these in the neighborhood, a Pathmark and a Shop-Rite near by. I occasionally purchase a pack to feed the habit.